Forever Shining provides variety in gravestones, including sizes and shapes. What is the purpose of a headstone? Headstones stand at the head of a burial site or are mounted as a memorial section on the top of a ledger panel. Typical shapes are square or rectangular. The slab is typically placed upright at the head of a grave. The basic message includes the name, date of birth and death, and a brief message regarding the deceased. Other shapes are available to identify the unique personality or calling of the departed. Custom shaped cemetery headstones can be requested and designed. If a ledger is placed over the grave, the headstone and other memorial objects can be placed at the head of the grave. There is also a spot to mount the headstone directly on the kerb placed around the ledger. The ledger panel provides several options of placing the marker to honor the decedent while displaying its information to all who pass by. During the stressful time following a loved one’s death, you can rely on our professionals to assist you and answer your questions regarding a headstone. 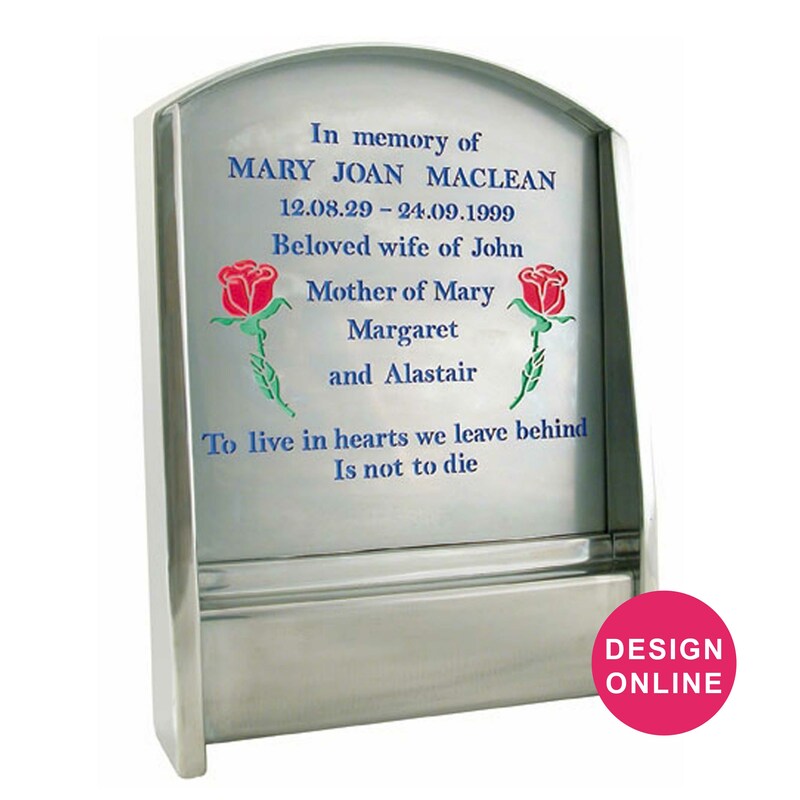 Discover the wide range of headstones available at Forever Shining. Each is designed to fit the needs of the family or person responsible for ordering the slab, which can be customised to deliver a message, quote, or important piece of information. If a non-standard variety from our website attracts your attention or you prefer a different shape, call or email us with your inquiry. We will set an appointment to discuss and design the memorial. Our laser-etched black granite headstones have been designed to compliment our range of funerary products and satisfy the needs of those customers who wish to continue to use a traditional material for their memorial. Our traditional inscription granite or sandstone headstones have been designed to compliment our range of funerary products and satisfy the needs of those customers who wish to continue to use a traditional material for their memorial. We make all types of headstones. 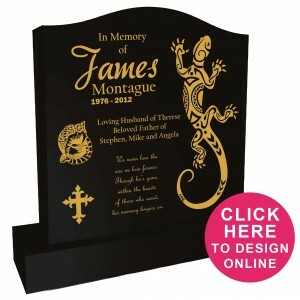 In any colour granite or sandstone with your design, inscription, images and motifs. We specialise in making a truly personalised memorial, customising to leave more than just a dot! Stainless steel headstone with glass-backed inscriptions and motifs. Many other options including photo inlays and photo overlays. Stainless steel headstone with coloured glass inscriptions and motifs. Many other options including photo inlays and photo overlays. Black granite headstone panel in a stainless steel surround with the same range of options as the full granite headstone. 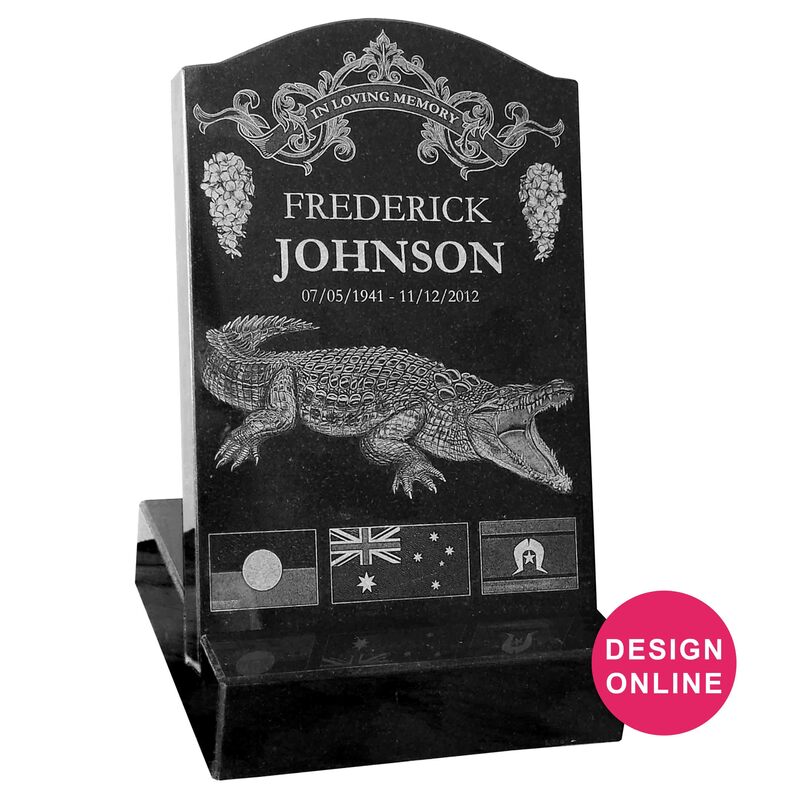 Premium black granite mini headstone that is mounted into a black granite base with laser-etched inscriptions, photos and motifs. Many other options including photo overlays. 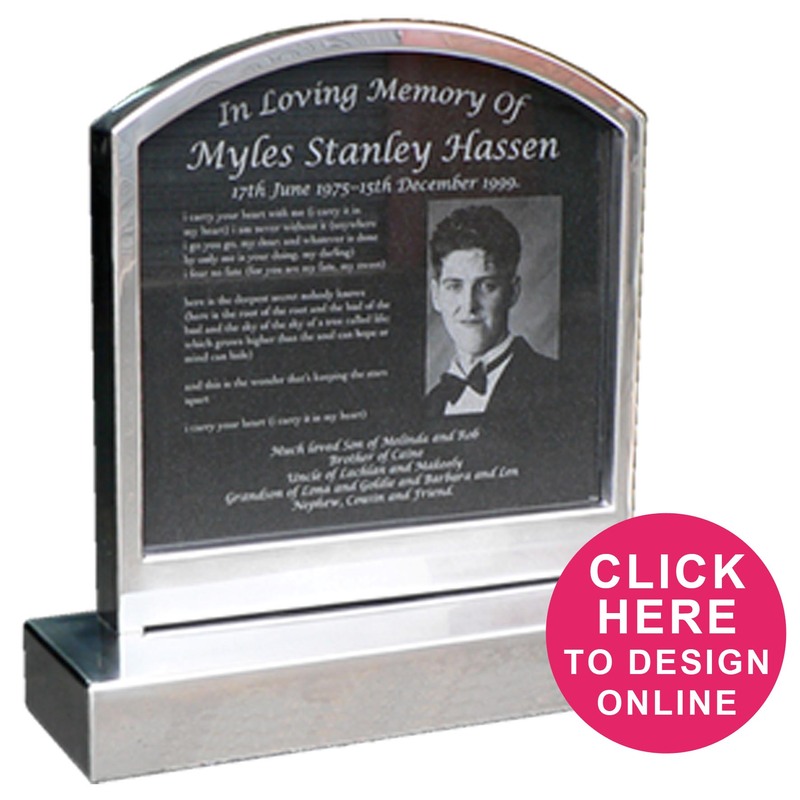 Premium black granite mini headstone that is flat mounted on to the ground with your laser-etched designs inclduing text , images and motifs.You have the option to add an image overlay. 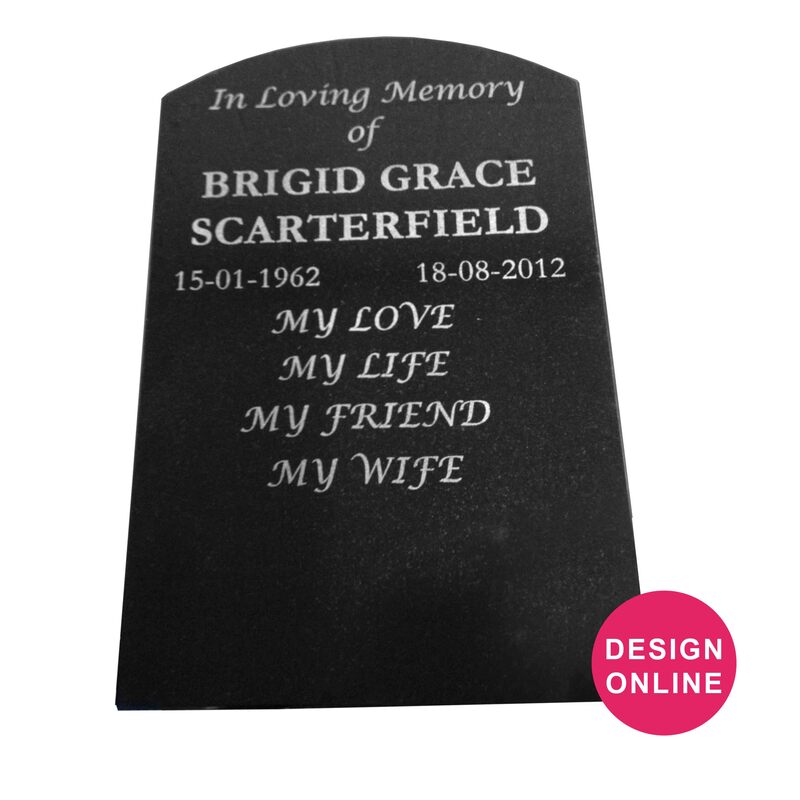 Premium black granite mini headstone that is buried into the ground 100mm, headstone with laser-etched inscriptions, photos and motifs. Other options include photo overlays. The laser-etching procedure enables the transfer of heart-warming, composite image of motifs, logos and photographs of the deceased permanently onto the exterior of headstone, making it the perfect memorial in honour of your loved one. 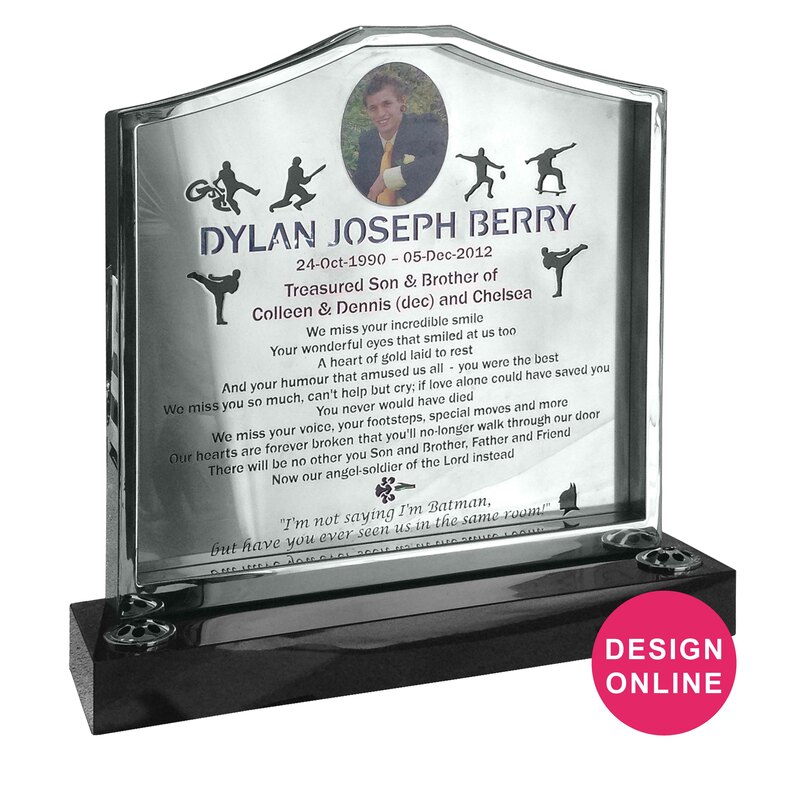 Customised laser-etched black granite headstones are just one of many memorial products that can be permanently decorated using the laser, and you will find by looking through the products page an extensive selection fulfilling any requirement you may have. Regardless of any size and shape headstone you are after, we are able to carve one to any specification you have. 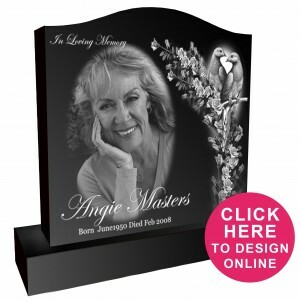 Alternatively, you can choose from our widespread standard headstone collection we have here in Australia. As a cutting edge company who endeavour to bring the most up-to-date technology to our potential and repeat customers, we are fast becoming the preferred favourite for our commitment providing bringing the best to every one of our clients. By having the upper hand over our competitors due to our advanced technological services, our customers are able to design their headstone in any location they are in and exactly the way they want it to look. Whether you are in CBD Melbourne, or a rural community in outback Northern Territory, you have the same opportunity to order online and have delivered wherever you wish a beautiful engraved headstone, made from only the best granite available in the world. Whether you want a stainless steel, traditionally engraved or laser-etched granite headstone, whatever you choose will look exclusive in the location of its final resting place. In addition to providing headstones for people, we also offer customisable pet headstones as we understand the importance of the relationship you had with your pet and there’s every reason to commemorate these relationships in the best way possible. 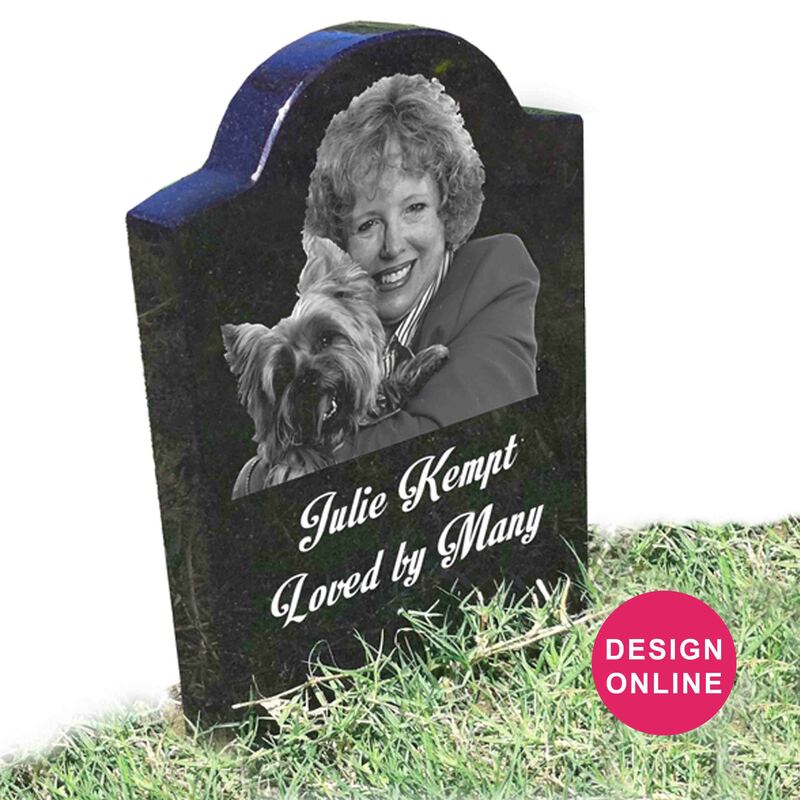 For this reason, we provide an extensive range of pet headstones to choose from. Headstone prices around Australia for example in larger cities such as Sydney or Melbourne, prices can be exuberant especially when you purchase one through a funeral home or cemetery. The prices of our headstones are very affordable as we cut out the middle man and provide cut-priced stones, straight from the factory. Because of this, our prices are very much tempting, and don’t let them fool you as we only use the highest quality granite. Our entire product and service follows a very strict code of conduct. These codes are Quality and Affordability and we stand by them with every headstone we manufacture, not only because we are an Australian company who believes in consistency, reliability and loyalty to the customer, but to also keep you Forever Shining with beautiful memories of your loved one.